The Tesla Roadster has some new competition. Shelby SuperCars (SSC) is preparing to release an all-electric version of their Ultimate Aero super car ("the world's fastest production car," according to SSC). The Ultimate Aero EV will replace the internal combustion engine with two of SSC's newly developed All-Electric Scalable Powertrains (AESP) to produce 1,000 HP and 800 lb-ft of torque, enabling the electric roadster to rocket to 60 mph in a mere 2.5 seconds! That's almost twice as fast as the all-electric Tesla Roadster. The Ultimate Auro EV will have a top speed of 208 mph and an all-electric range of 150-200 miles on a single charge. Shelby also claims the electric sports car will come equipped with the company's "Charge on the Run" on-board charging system which "allows for full battery recharges in as little as 10 minutes." SSC will display its AESP in the Ultimate Aero EV in order to prove that electric-powered vehicles will not only match but also provide more linear power (electric motors have 100% torque at 0 RPM) and overall performance than internal combustion cars. The company plans to start "full-scale preproduction" of the Ultimate Aero EV in the second quarter of this year, and also plans to package their AESP electric motors for "a wide variety of applications ranging from 200 horsepower for economy and midsize cars, to 500 horsepower for light trucks and SUVs, and up to 1,200 horsepower for delivery trucks, heavy-duty equipment, buses and military vehicles." The Ultimate Aero EV will be the first vehicle to highlight the "green" technologies developed by SSC Green Inc., a new wholly-owned subsidiary of Shelby SuperCars. The simultaneous collapse of our economic and ecological systems has created a great opportunity to support industries that at once rebuild the market and the planet, according to an article by economist Robert Pollin, "Doing Recovery Right," appearing in the latest issue of The Nation. The transition of the economy from a fossil-fuel to a renewable resource base will provide new jobs and revitalize the American working class, argues to Pollin, who is also the author of the in depth report "Green Recovery," examining the job creation benefits of a $100 billion, two year investment to building a clean energy economy. "The transition to a clean energy economy has the capacity to merge the aims of environmental protection and social justice to a degree that is unprecedented," Pollin writes. "It is an opportunity that must not be lost." In the video below, Pollin and The Nation contributor Liza Featherstone discuss the potential for public investments to spark the transition to a new energy economy and create jobs in industries both new and familiar - from construction and manufacturing to new energy and high tech industries. For more on the power of public investments to build a new, prosperous clean energy economy, see the "Green Recovery" report and Pollin's article, "Doing Recovery Right" appearing in the current of The Nation. We wanted to write and give you an update on what's happening with the mountain. There has been a lot going on, not much of it in our favor, so we could still use your help in spreading awareness of the campaign and the urgency of the situation. Please continue to share our website and the story of Coal River Mountain with your friends and colleagues, and even write letters to your local newspapers and legislators urging their support for the residents of the Coal River Valley. First of all, Massey has begun pre-mining activities below the ridge where the first phase of mining is set to begin. It is hard to determine exactly when they will be set to blast, and for now they have yet to construct a road up to the ridge, but they have shown their intent by clearing the forest and constructing a road and sediment ditches approximately 150 [ft?] below the ridge, so we expect that they will be ready to clear the ridge in the coming weeks, but we'll keep you updated on that. We'd like to once again bring attention to the economic report conducted by Downstream Strategies out of Morgantown, WV that we released last December. 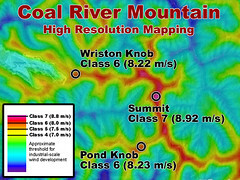 The report analyzed the economic costs and benefits of going with wind versus mountaintop removal for Coal River Mountain, and concluded that the development of a 328 Megawatt wind farm (enough to power about 70,000 homes) stands as the best economic land use option for the mountain, the communities and the county government. This was the evidence we'd been waiting for, and we truly though for a while that the report couldn't be ignored by state and local leaders. This hope was shattered on January 6th when we took the result of the study to the Raleigh County Commission. 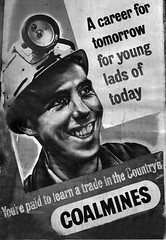 Instead of embracing the study's conclusions and the opportunity to diversify the local economy and bring in new industries that would help soften the blow of the boom-and-bust cycles of coal, the Commission chose to ignore the merits of the study altogether and instead chose not to "pit one industry against another." Unfortunately, the Commission and the state government are holding tight to that false logic, and so we are now hoping to catch the attention of national leaders who might help us in the fight for the future of the mountain. We got a big boost in that effort yesterday when Salon.com published a wonderful and comprehensive article about the campaign written by Appalachian author Jeff Biggers ("The United States of Appalachia"), whose own family home in Indiana has been destroyed by strip-mining for coal. The article gives a great accounting of the campaign since its beginnings, as well as a more comprehensive update on where the campaign now stands [editors note: the Salon article is a must read!]. Salon.com gets nearly 6 million readers a month and so we appreciate Jeff's article and his persistence in spreading awareness for the wind campaign. You can read the article by clicking here. We also continue to fight the proposed mining on legal grounds, and on February 10th we will be going before the Surface Mine Board to challenge the permit revision that was approved for the Bee Tree surface mine back in November. The hearing will be held at the Department of Environmental Protection headquarters in Kanawha City (Charleston) at 601 57th St. 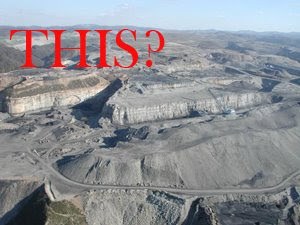 The hearing will begin at 8:30am, so if you're free please come out and show your support for Coal River Mountain. Here is a link for directions to the hearing. That's about it for now, we will keep you updated as things happen and we hope you continue to support us in this effort. When it comes to the geography of climate politics, it doesn't break down along the much-ballyhooed "red state/blue state" divide. It's really more about coal states vs. clean states, as John Broder reports in yesterday's New York Times. That's a rift that risks dividing Senate Democrats as climate policies move forward in the 111th Congress. Broder notes, "This brown state-green state clash is likely to encumber any effort to set a mandatory ceiling on the carbon dioxide emissions"... that is, unless climate advocates heed the concerns of the "Technology Fifteen." That's the group of moderate Democratic Senators who have banded together to ensure that the concerns of their "middle America" states are not ignored in the upcoming climate debates. "My message over all is that for us to support what needs to be done in addressing global warming we need to demonstrate that, in fact, jobs are created," Ms. Stabenow said. "It's not a theoretical argument. We have to come up with a policy that makes sense, that is manageable on the cost end, that creates new technology, and that treats states equitably and addresses regional differences." So, for climate advocates, that's our test: if we want climate policy passed in the US, we need to convince Senators Stabenow, Brown and the rest of the Technology Fifteen that (a) our policy proposal is actually good for their states' economies (rhetoric aside), (b) the costs of compliance are manageable and contained, (c) it will invest heavily in clean energy technology development and deployment, and (d) it will not disproportionately impact different states. It doesn't get much clearer than how she lays it out there. Obama: "No single issue is as fundamental to our future as energy"
Today, Barack Obama announced several measures to increase America's energy independence and reduce the threat of global climate change. In a speech delivered at the White House, President Obama said, "These are extraordinary times," adding, "At a time of such great challenge for America, no single issue is as fundamental to our future as energy." "America's dependence on oil is one of the most serious threats that our nation has faced. It bankrolls dictators, pays for nuclear proliferation and funds both sides of our struggle against terrorism. It puts the American people at the mercy of shifting gas prices, stifles innovation, and sets back our ability to compete. "Year after year, decade after decade, we've chosen delay over decisive action. Rigid ideology has overruled sound science. Special interests have overshadowed common sense. Rhetoric has not led to the hard work needed to achieve results and our leaders raise their voices each time there's a spike on gas prices, only to grow quiet when the price falls at the pump." Mr. Obama said that today, "America has arrived at a crossroads," adding that it is now the nation's time to "choose whether to risk the peril that comes with our current course or to seize the promise of energy independence. And for the sake of our security, our economy and our planet, we must have the courage and commitment to change." President Obama then promised, "It will be the policy of my administration to reverse our dependence on foreign oil while building a new energy economy that will create millions of jobs." He recognized that the challenge will not be easy. "I cannot promise a quick fix," he said. "No single technology or set of regulations will get the job done." Obama then promised to "commit ourselves to steady, focused, pragmatic pursuit of an America that is freed from our energy dependence and empowered by a new energy economy that puts millions of our citizens to work. " 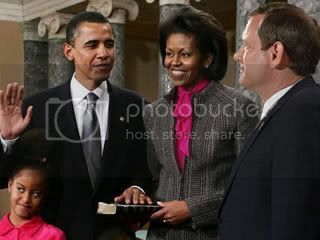 The president then went on to announce what he called "the first steps on our journey toward energy independence," including new investments in Obama's economic stimulus package to harness clean energy, a directive to move forward with new regulations to increase the efficiency of American cars and trucks passed by Congress in December 2007, and a new directive to the Environmental Protection Agency to allow California and 13 other states to set stricter standards for greenhouse gas emissions from the tailpipes of personal vehicles. 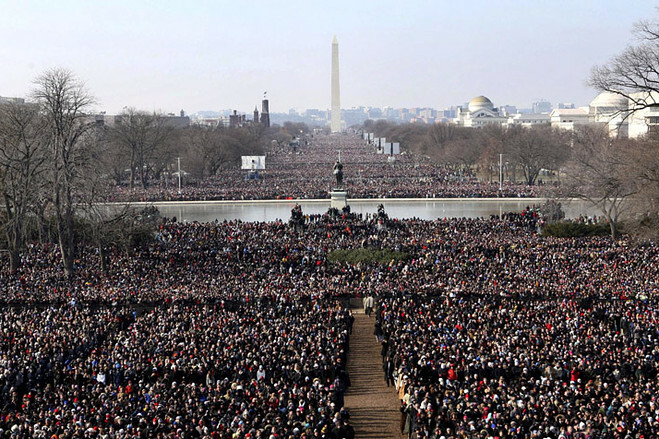 "Each step," President Obama said, "begins to move us in a new direction, while giving us the tools that we need to change." "First we must take bold action to create a new American energy economy that creates millions of jobs for our people. The American Recovery and Reinvestment Plan before Congress places a downpayment on this economy. But instead of serving as a partner, Washington stood in their way. This refusal to lead risks the creation of a confusing and patchwork set of standards that hurts the environment and the auto industry. We will not be put off from action because action is hard. Thank you so much for being here." 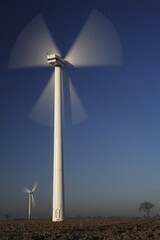 Register today for Power Shift 2009! Public opinion on global warming lags far behind the rhetoric and apparent commitment shown by President Obama and other elected officials, according to reports today from Andy Revkin at the New York Times (in print and on his DotEarth blog). "The latest in an annual series of polls from the Pew Research Center on people's top priorities for their elected leaders shows that America and President Obama are completely out of sync on human-caused global warming," Revkin writes, pointing out that "Mr. Obama stressed the [global warming] issue throughout his campaign and several times in his inaugural speech, mentioning stabilizing climate in the same breath as preventing nuclear conflict at one point." "Here's the list from top to bottom, with the economy listed as a top priority by 85 percent of those polled and global warming 30 percent: the economy, jobs, terrorism, Social Security, education, energy, Medicare, health care, deficit reduction, health insurance, helping the poor, crime, moral decline, military, tax cuts, environment, immigration, lobbyists, trade policy, global warming." "Only 30 percent of the voters deemed global warming to be "a top priority," compared with 35 percent in 2008. "Protecting the environment," which had surged in the rankings from 2006 to 2008, dropped even more precipitously in the poll: only 41 percent of voters called it a top priority, compared with 56 percent last year. In contrast, dealing with the nation's energy problems ranked sixth in the poll -- just behind education and social security -- with 60 percent of voters endorsing it as a top priority." With gas prices falling precipitously over the last several months (prices at the pump seem to be the only thing falling faster than the value of people's retirement accounts), public concern for energy issues has also slipped somewhat from June, when it ranked #2 in a similar Gallup poll of top public concerns. Still, the salience of energy costs and energy independence still seems far higher than global warming for the American public. The poll also makes abundantly clear that, above all else, Americans will clearly be judging just about every public policy proposal through the lens: "is this good for the economy and for my job?" All this said, it's also fair to say that polls that silo complex and interlinking issues like "global warming," "energy," "the environment," etc. are not the best indicators of the potential success or failure of broad policy proposals. 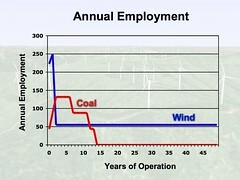 For example, President Obama or others could make a clear and convincing argument that a policy to reduce global warming pollution will raise revenue that we can invest in clean energy technologies, creating new energy industries and jobs, increasing the efficiency of our homes and business, cutting our oil dependency, etc. (Nancy Pelosi seemed to frame things that way in the Chronicle yesterday). In that case, the polling figures for "global warming" as an isolated issue will clearly not be the most accurate barometer of the proposal's popularity. Still, Obama and other leaders beware: these numbers would seem to point to a very uphill battle for any proposal framed centrally or primarily as a "climate bill," rather than an "energy independence-economic recovery-and-climate bill." Perhaps more crucially, any proposal that can be painted as bad for the economy will also most certainly run right into a brick wall of public opposition..
Swan Pond Road: The Kingston Coal Disaster from SRmanitou on Vimeo. In Northern Virginia today, President-elect Barack Obama addressed the nation, introducing a few basic goals and guidelines for an economic stimulus package that could cost as much as a trillion dollars. "It is true that we cannot depend on government alone to create jobs or long-term growth, but at this particular moment, only government can provide the short-term boost necessary to lift us from a recession this deep and severe. Only government can break the vicious cycles that are crippling our economy - where a lack of spending leads to lost jobs which leads to even less spending; where an inability to lend and borrow stops growth and leads to even less credit." Energy. 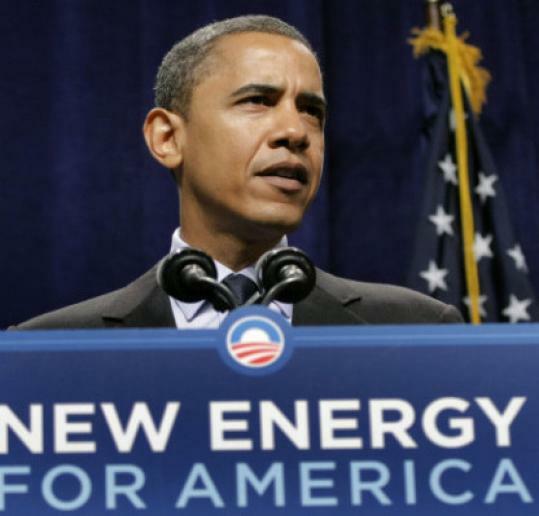 Obama spoke about expanding America's production of alternative energy over the coming years, doubling its capacity by 2012. He also spoke about putting Americans to work retrofitting and weatherizing at least 75% of government buildings and 2 million homes to be more efficient. He also spoke about creating a dynamic and innovative alternative energy sector in America, saying, "we will put Americans to work in new jobs that pay well and can't be outsourced... and developing the new energy technologies that will lead to even more jobs, more savings, and a cleaner, safer planet in the bargain." "To build an economy that can lead this future, we will begin to rebuild America." Infrastructure. Referring to his infrastructure plans as "not just another public works program," Obama did say that part of the infrastructure spending would go to rebuilding roads and bridges and executing worthy and well-planned public works projects. However, Obama's framed these infrastructure investments as primarily about retrofitting America to compete in a 21st century global economy. This included the construction of a unified national smart grid that "will save us money, protect our power sources from blackout or attack, and deliver clean, alternative forms of energy to every corner of our nation." In addition, the President-elect mentioned the need to expand broadband across America, to rural areas and small towns. "And it means investing in the science, research, and technology that will lead to new medical breakthroughs, new discoveries, and entire new industries." Innovation. Obama also spoke of the need to build a new innovation infrastructure, saying he would invest in R&D to promote economic growth and breakthroughs that will create broad-based prosperity. Hopefully, Obama will pursue a robust innovation policy seriously, as technology and science innovations, along with increasing productivity, can create entire new industries and sectors of the economy. "To improve the quality of our health care while lowering its cost, we will make the immediate investments necessary to ensure that within five years, all of America's medical records are computerized." Healthcare. Obama confined his healthcare ideas to digitizing medical records. Not only will it reduce wasteful spending, he argued, but it will cut back on treatment errors, saving lives and creating a healthier America. "To give our children the chance to live out their dreams in a world that's never been more competitive, we will equip tens of thousands of schools." Education. Modernizing schools with new technologies and computers, along with new training for teachers, will play a role in the stimulus, ensuring the long term competitiveness of America's up and coming generations. Obama spoke about bringing 21st Century classrooms, labs and libraries to America's public schools, community colleges and public universities, "so that students in Chicago and Boston can compete with kids in Beijing for the high-tech, high-wage jobs of the future." "Finally, this recovery and reinvestment plan will provide immediate relief to states, workers, and families who are bearing the brunt of this recession." States and Citizens. The proposed stimulus plan would include a $1,000 tax cut for 95% of working families, the first stage of tax cuts that Obama pledged to make during his campaign. Obama also spoke about extending unemployment insurance and health care coverage to those who have already lost jobs and are having trouble reentering the workforce. And, while he said that governments would have to "tighten their belts," the federal government would also step in to avoid harmful budget cuts to states so that they can keep their public sector workers employed. While Obama outlined a solid framework for stimulus and recovery, as usual, the devil is in the details, and the President-elect's speech was lacking in that capacity. 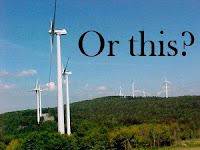 For example, what does he have in mind when he talks about "alternative energy?" Is he only referring to the electricity sector, or does he have transportation and heating fuels in mind as well? Will doubling America's capacity for "alternative energy" include increasing the production of coal-fired power plants using carbon capture and storage technology? Does the baseline we're doubling from include hydropower? If hydropower is included, Obama is pledging to take "alternative energy" to around 20% of US electricity supply; if it's not we'll be taking it to just 7% of US electricity supply, so nuances like this can clearly make a big difference in the way we parse Obama's speech today. Obama also provided very little specificity as to the policy tools he plans to use to accomplish these priorities. Will he beef up the clean energy production tax credit, or will the government invest directly in the production of energy with financing, procurement and fully refundable credits? The lack of specificity in today's speech likely indicates that Obama still has a lot of details to work out with Congress, and it'll be important to watch as these details are unveiled in the weeks ahead. But for what it was--a political speech laying the groundwork for Obama's vision of governance, it was a reassuring sign that the President-elect has the right objectives for stimulus spending. Obama identified six areas of domestic policy in which he would prioritize expending his political capital, each framed centrally around an effort to use stimulus spending to lay the groundwork for sustained economic growth. Investments in clean energy technology, innovation and R&D, critical public infrastructure like a unified national smart grid and broadband networks, digitizing medical records, building modern schools and research facilities, and helping out state budgets are all smart investments that create both short-term economic stimulus and lay the groundwork for long-term productivity and economic competitiveness. He also included language about bipartisanship, and worked to appease perhaps his biggest barrier to a sizable stimulus plan, Congress's Blue Dogs. This faction of moderate Democrats from centrist districts who preach fiscal responsibility and adherence to pay-as-you-go fiscal standards seem receptive to Obama, and have already started rallying behind the stimulus. Perhaps most importantly, Obama identified a vision for a brighter American future - a nation prosperous again, more competitive in a global 21st century economy, and powered by a cleaner, more efficient energy system - and then sketched out a plan that will put us on the road to that future. And, with Speaker Pelosi already saying that Congress will not be taking a recess until an economic stimulus bill has been passed into law, it seems that we might be starting down that road sooner rather than later. 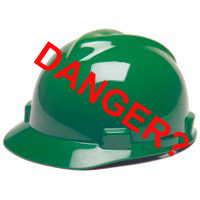 What's the Danger with Green Stimulus and Green Jobs? Barack Obama's final appointments in December indicate a strong commitment to action on climate change. Steven Chu as Energy Secretary, Carol Browner as Energy & Climate Czar, John Holdren as Assistant for Science and Technology -- just to name a few recent selections -- are all proponents of vigorous action to cut U.S. global warming pollution and take leadership on a new international climate treaty. And Hilda Solis, Obama's new Labor Secretary, is a champion of "green jobs." All is well on the climate front, it seems. Except that it's not. Despite Obama's energy and environment cabinet appointments, cap and trade legislation still faces a very uphill battle, and in today's economic situation, climate advocates are still left to worry: is Obama really prepared to expend his political capital championing a policy that will increase U.S. energy prices in the midst of a recession? It doesn't seem likely. And simply replacing sustained climate legislation with a short-term "green stimulus" program to create green jobs and perform energy efficiency retrofits is a dangerous possibility. Find out why by reading my recent column, written with my colleague Teryn Norris, at Huffington Post. Full story is at Huffington Post here. 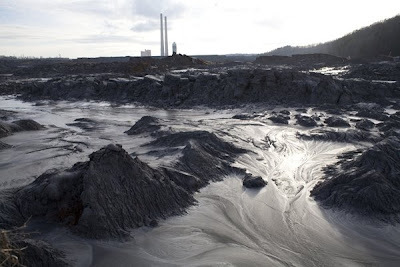 Photojournalist Antrim Caskey documented the devastating scenes on the ground at the massive coal sludge spill that occurred on December 22nd near the town of Harriman, TN. The spill, which is one of the worst environmental disasters in U.S. history affected over 300 acres of land and water, contaminating fish and drinking water and destroying homes and ecosystems in this verdant corner of eastern Tennessee. You can find more of Antrim's photos, including images documenting the damages of mountaintop removal coal mining in Appalachia, at www.antrim-new.com.